There is no one-size-fits-all method to quit tobacco. These documents can help Veterans and health care providers better understand the resources that VA and the National Cancer Institute have developed to support Veterans in VA care to quit tobacco. 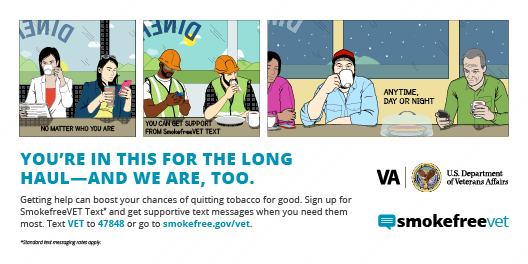 The VA quitline, 1-855-QUIT-VET, and SmokefreeVET programs ensure that your patients receive support in their quit—even when they aren’t in the clinic. Please distribute these materials among providers working in Primary Care, Mental Health, Dentistry, and Pharmacy, as well as other providers working in specialty clinics at VA Medical Centers and Outpatient Clinics. These materials may also be used by community providers who see Veteran patients from VA. The patient-focused materials can be shared at health fairs and events for Veterans. 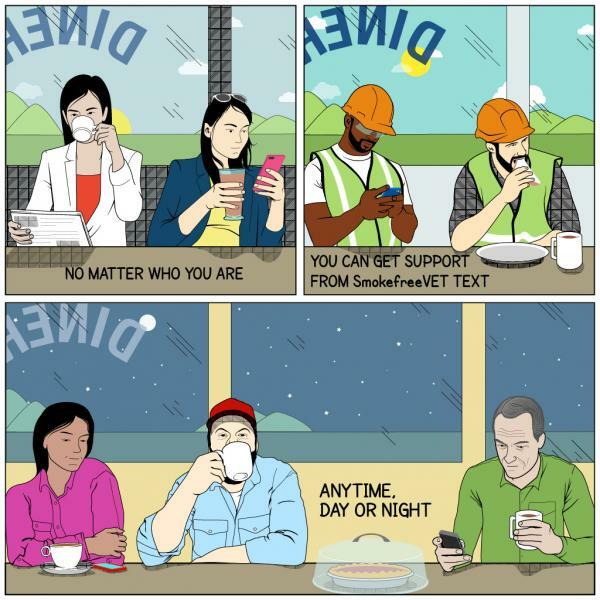 SmokefreeVET Text sends supportive text messages when your patients need them most and can provide immediate tips and strategies in response to keywords such as URGE, STRESS, SMOKED, and DIPPED. Veterans can join online or by texting VET to 47848. The Spanish language program can be joined through the online form or by texting VETESP to 47848. Standard messaging rates apply. 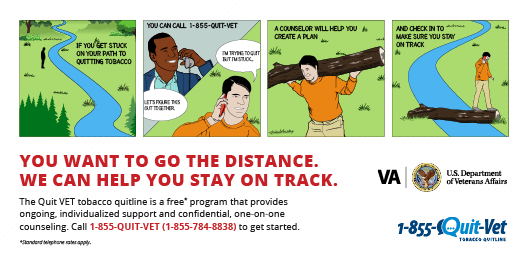 Veterans who receive their health care from VA may also call 1-855-QUIT-VET to receive one-on-one tobacco cessation counseling over the phone from tobacco cessation counselors at the Quit VET Quitline. 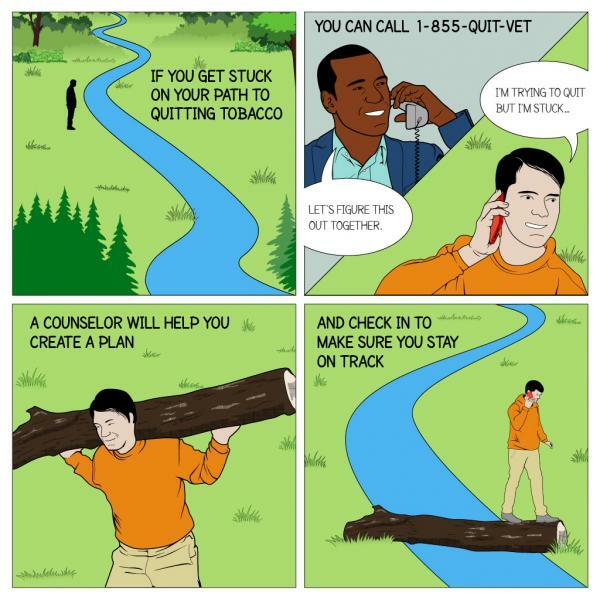 Quit VET counselors provide behavioral counseling to address tobacco use by helping Veterans develop a quit plan and following up during the quit process as needed to provide additional support, strategies, and counseling. For additional information on tobacco use treatment in VA, visit the VHA Tobacco & Health website. 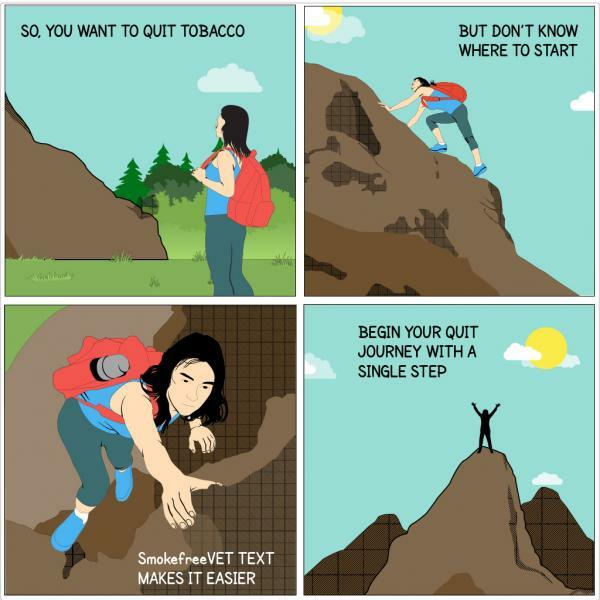 Use this one-pager to expand provider familiarity with the SmokefreeVET Text program to better explain the program to Veterans. Distribute this one-pager to providers to increase knowledge of the quitline and how it can be used in conjunction with other tobacco cessation resources. These hand-outs are patient-focused and have information about SmokefreeVET Text and the Quit VET tobacco quitline. Print them out for display in waiting rooms or to hand out at health fairs to Veterans considering quitting. 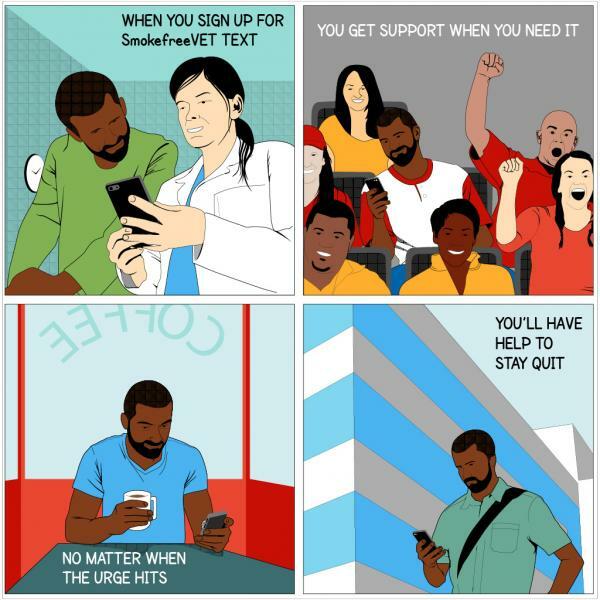 Display these posters in your waiting rooms and offices to encourage patients to talk to their providers about SmokefreeVET Text and the quitline. Use these digital versions of our materials, including short animated videos, in your social media feeds or for display on the digital billboards in your waiting rooms. Free yourself. Quitting means never worrying about where your next pack of cigarettes is coming from. Fact: Quitting smoking can re-wire your brain. The number of nicotine receptors in the brain will return to normal after a month smokefree. A smokefree life means lower risk for sexual problems, lung cancer, and wrinkles. Start living.